Ortho Sport & Spine Physicians in Atlanta is proud to be one of the Southeast’s leading providers of minimally invasive, Endoscopic Foraminotomy spine surgery. Our practice features a team of double board certified Interventional Spine physicians who are highly trained and qualified to perform endoscopic spine surgery, also known as “band-aid back surgery”. Using this advanced surgical technique, we are able to achieve amazing results for our valued clients. Using minimally invasive surgical techniques, we help patients with chronic or acute spine, back and neck conditions and injuries achieve long-term pain relief and improved function so they can return to an active, healthy lifestyle. Ortho Sport & Spine Physicians is pleased to offer expert minimally invasive back compression treatments to the residents of Atlanta and the entire Southeast. If you are suffering from acute or chronic back or neck pain due to a compressed nerve and more conservative treatments have failed to provide relief, you may be a good candidate for Endoscopic Foraminotomy. Endoscopic Foraminotomy offers many advantages over traditional open back surgery including fewer chances of complications, less post-operative pain and a shorter recovery time. With Endoscopic Foraminotomy, the spine remains in tact and there is little chance of scar tissue development. This has important implications for the long-term success of the procedure. The physicians from Ortho Sport & Spine Physicians are experts when it comes to performing Endoscopic Foraminotomy surgery. Our practice has invested in state-of-the-art technology and equipment for use in our endoscopic surgical procedures. We combine this technology and equipment with our experience and expertise to provide effective minimally invasive surgical solutions for our valued clients. Endoscopic Foraminotomy is a minimally invasive spine surgery procedure that can be used to relieve pressure in the spine caused by compressed nerves. The procedure involves inserting a small metal tube into the Neuroforamen and then using special equipment to remove any bone spurs, scars, ligament overgrowth or part of a protruded disc that is placing pressure on the nerve. 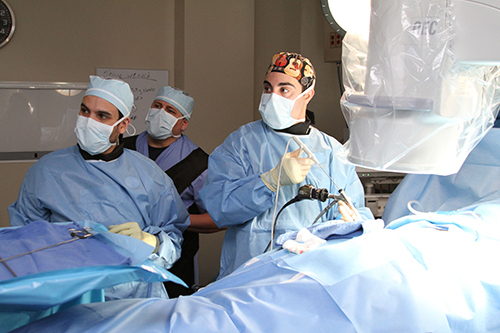 Endoscopic Foraminotomy is an outpatient procedure. After the surgery, patients can return home with a small band-aid placed over the incision. If you would like to get more information or to find out if you are a candidate for this minimally invasive surgical procedure, please contact our Atlanta Endoscopic Foraminotomy Specialists at Ortho Sport & Spine Physicians today and schedule a consultation with one of our Interventional Spine doctors. For your convenience, we accept most insurance plans as well as several other forms of payment. We look forward to helping you stay active and live your best life!